This was the answer I gave to a young business person who asked me recently how the loft was so busy and why we are working on so many new projects at the moment. It is devastatingly simple when you think about it, so simple I have missed it myself, a few times in the past. We picture happy clients, we visualise them giving out their business cards, showing off their websites, sharing their info-graphics on social media. We make storyboarding one of the most important parts of our creative process. We don’t start with typography or graphics or technology or what others are doing. We take a positive scenario and work backwards. I know this approach sets us apart from many other agencies and many other service providers. How can we make our solutions work for the client? What do we need to do to achieve an effective result for them? How can we make them happy? Delighted even? The client provides the framework and it’s our job to shine within that framework. This regularly takes us off the beaten path but it does help the people we work with, to shine. It allows them to pass their business cards to others with absolute confidence, to provoke a person to go to the ‘contact page’ on their website or to tempt a person to pick the bottle off the shelf. We are relentlessly focussed on those details because they are the things that matter. They are going to help our clients and by helping our clients, we know they’ll come back again and again, and sometimes refer new people too. The method changes, but the result always remains – happy clients. Richard Seymour’s, ‘How Beauty Feels’ in my favourite TED talk, he discusses creating things that are just wonderful for people – our ethos is the same. This focus allows us to deliver solutions quicker, we are able to maximise client budgets, it allows us to concentrate on what’s important. The process also gives us endless scope for creative solutions. Thankfully, we have a team of exceptional designers and suppliers who can mould their considerable talents around those bespoke requirements, talented people who have the humility to understand that the best way they can be the stars is by shaping their skills to the benefit of those that they serve. Our approach is effective but it does require people with open minds, good intuition and exceptional basic skills. Thankfully we have just those people. Some (crazily I believe) ask if it can be tiresome hearing how good you are all the time? People using the word ‘love’ when talking about things you have done for them or seeing their materials shine on social media is a tremendously uplifting experience. And one that generates its own momentum to keep on going. 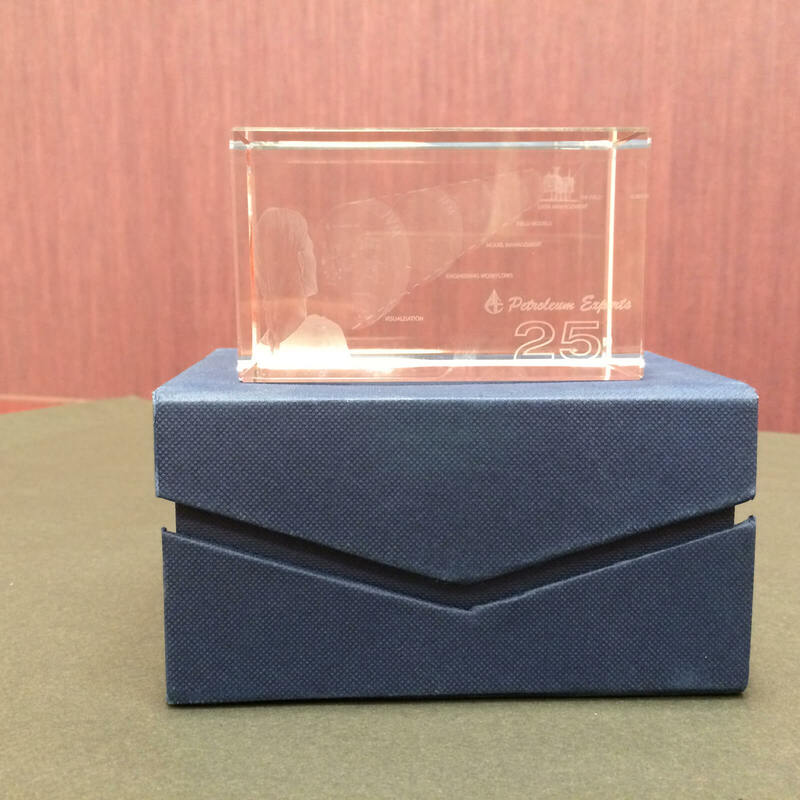 The Advert we created for Petroleum Experts, found its way onto this very large 3-Dimensional, glass paperweight, something they gave to their clients for their 25th anniversary. Or how about working with a client who in 25 years, having never worked with a creative agency, loving their design so much that they re-produce it in glass to give to their clients on their own 25th Anniversary Dinner. That last moment is one that happened recently when Hamid Guedroudj and James Woodrow of Petroleum Experts pulled me into their office and presented me with a blue box and inside was one of the biggest paperweights I have ever seen – and one with the design that we co-created with them. A bit of a favourite moment amongst many. When you start with happy faces and things like this happen you cannot help but have a happy face yourself. 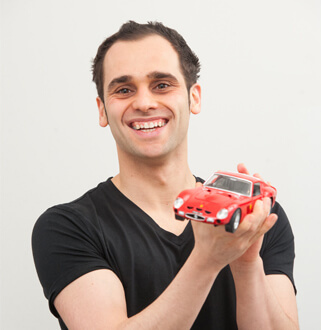 Benedetto is the founder of the loft, a design and branding agency based in Glasgow. The loft helps its clients build more effective brand communications and operates in a diverse range of sectors, specialising in technology, packaging design and professional services. The company is proud to include Petroleum Experts, The Wood Group, BenRiach Whisky, The University of West of Scotland and Glasgow City Marketing Bureau amongst its clients. The loft offers people-centred brand solutions created using imaginative thought processes and delivered with a consistently high-quality and bespoke client service. The loft is looking beyond traditional creative services and has begun to produce more integrated brand journeys for its clients – tying together disciplines such as digital, social media and customer experience – in addition to sales & marketing to help companies attract and retain customers & staff. Essentially, building a stronger bond between the person and the brand. The loft was setup with assistance by PSYBT in 2012 and received Growth Funding the following year. Benedetto is the regional ambassador for the Princes Trust in Glasgow and also provides support to other charities including Young Enterprise Scotland, SMART STEMs and MCR Pathways.